The Acting Cook County Illinois Public Guardian filed a class-action lawsuit (Golbert et al v. Walker et al) December 13, 2018 on behalf of hundreds of children and teenagers in state care who have been held in psychiatric hospitals after they had been cleared by doctors for release, calling the practice inhumane and unconstitutional. 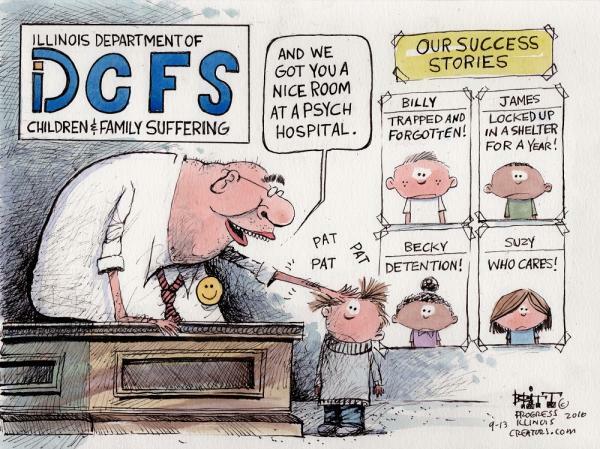 The lawsuit follows a ProPublica Illinois investigation that found nearly 30 percent of children in DCFS care who were sent to psychiatric hospitals between 2015 and 2017 were held there after doctors had cleared them for discharge. It may not legally be Involuntary Commitment, but it has the same harmful physical and emotional effects. Some children were sexually exploited. Every 1¼ minutes, someone in the U.S. becomes the next victim of involuntary incarceration in a psychiatric hospital. And there’s nothing they can do about it. With health care eating up vast amounts of our national budget, the first spending cut to make is the cost of “treating” people who prefer not to be mentally treated or whose treatment is no longer necessary. Involuntary incarceration hikes federal, state, county, city and private health care costs under the strange circumstance of a patient–recipient who is not allowed to leave when treatment is over. ProPublica Illinois found that DCFS spent nearly $7 million on medically unnecessary hospitalizations between 2015 and 2017. The Missouri General Assembly is the state legislature of the State of Missouri and is composed of two chambers: the House of Representatives and the Senate. The General Assembly is responsible for creating laws for governing the State of Missouri. The Revised Statutes of Missouri (RSMo) are electronically available on this site: http://revisor.mo.gov/. The Ninety-Ninth General Assembly, Second Regular Session, will convene at 12:00 P.M., Wednesday, January 3, 2018. Pre-filing of bills started December 1, 2017. This time we’d like to discuss several bills which we’d like you to write your legislators about. Please write from your viewpoint as an individual or professional, and not as a representative of any organization. Let us know the details and any responses you get. The full text of each bill can be found on the House and Senate Joint Bill Tracking site. Just put the bill number into the search box (e.g. SB661). Check out our handy discussion about How to write to a legislator. If you are not a voting resident of Missouri, you can find out about legislation in your own state and write your own state legislators; also, we are looking for volunteers to monitor legislation in Missouri and the states surrounding Missouri — let us know if you’d like to help out. These are bills that further psychiatric abuses of human rights. Please express your opposition and opinions about these to your legislators and copy the sponsors. 1) SB661 – Senate Bill 661 – sponsored by Senator Jeanie Riddle (Republican, District 10). This act provides that after a person accused of committing a crime has been involuntarily committed to the Department of Mental Health due to lack of mental fitness to stand trial, the legal counsel for the Department shall have standing to participate in hearings regarding involuntary medications for the accused. The subject of this bill had been introduced previously in 2016 and 2017. We think it is very bad because it allows the Department of Mental Health to force psychiatric drugs on involuntarily committed citizens. Both of these actions — involuntary commitment and enforced drugging — are psychiatric abuses of human rights. 2) SB785 – Senate Bill 785 – sponsored by Senator Jamilah Nasheed (Democrat, District 5). This act establishes the Coordinating Board for Mental Health Issues in Higher Education (CBMHI). Each public institution of higher education in Missouri shall have one representative, who is either an administrator or counseling director, on the CBMHI. It requires setting standards and regulations for student counseling facilities that relate to mental health problems, and developing a process for measuring a higher educational institution’s ability to meet student mental health needs. In other words, it will promote psychiatric and psychological counseling, and likely recommend psychiatric drugs as well. While this sounds altruistic, we know that the current state of psychiatric and psychological counseling is an abuse of human rights. 3) HB1363 – House Bill 1363 – sponsored by Representative Bill Kidd (Republican, District 20). This bill requires teachers and principals to complete two hours of suicide prevention education each school year. Again, while this sounds altruistic, the current state of so-called “suicide prevention education” is a recommendation for harmful and addictive psychiatric drugs, which are known to cause the very thing they are supposed to prevent, which is violence and suicide. 4) HB1419 – House Bill 1419 – sponsored by Representative Marsha Haefner (Republican, District 95). This bill requires certain health care professionals to complete two hours of suicide prevention training as a condition of licensure. More of the same — the current state of so-called “suicide prevention training” is a recommendation for harmful and addictive psychiatric drugs, which are known to cause the very thing they are supposed to prevent, which is violence and suicide. These are bills that support human rights and oppose psychiatric abuses. Please express your support and opinions about these to your legislators and copy the sponsors. 1) SB672 – Senate Bill 672 – sponsored by Senator Andrew Koenig (Republican, District 15). This act provides that during a child protective investigation if the child is at risk for possible removal the Children’s Division shall provide information to the parent about community service programs that provide support services for families in crisis. Additionally, a parent may temporarily delegate to an attorney-in-fact any powers regarding the care and custody of a child, where a child subject to such power of attorney shall not be considered placed in foster care. This returns parental rights to the parents instead of forcing a child into foster care. We think this is supportive of human rights, not to mention preventing a child from receiving psychiatric drugging which almost always occurs in foster care. 2) SB786 – Senate Bill 786 – sponsored by Senator Jill Schupp (Democrat, District 24). This bill modifies provisions relating to “whistle-blower’s” protection for public employees by broadening its scope of application and extending protections to the whistle-blower. 3) HB1294 – House Bill 1294 – sponsored by Representative Cheri Toalson Reisch (Republican, District 44). This bill specifies that parental liberty to direct the upbringing, education, and care of his or her children is a fundamental right. 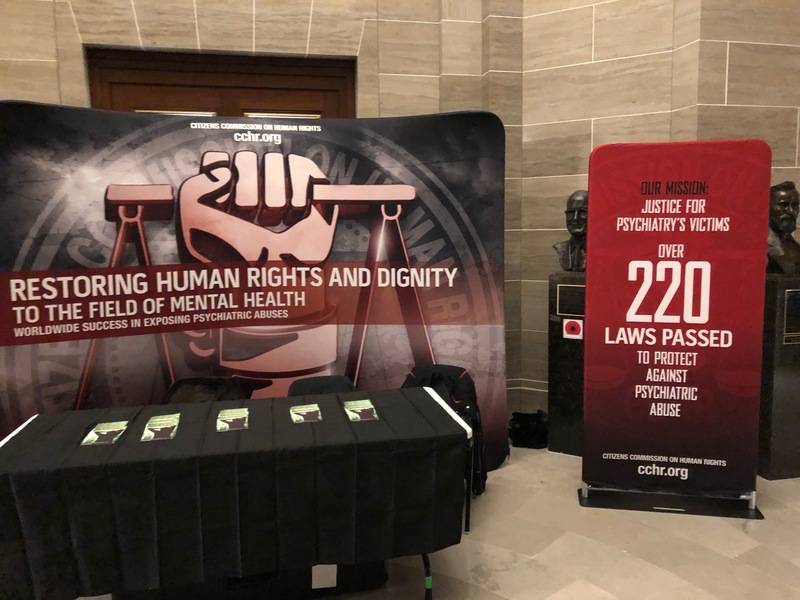 The State of Missouri and any political subdivision of the state is prohibited from infringing on this right without demonstrating a compelling governmental interest. 4) HB1451 – House Bill 1451 – sponsored by Representative Karla May (Democrat, District 84). This bill prohibits the use of electroconvulsive therapy on children under 16 years of age. Any person or mental health facility that administers electroconvulsive therapy to someone under 16 years of age will be fined up to $100,000 or imprisoned for two years, or both, and will be liable for compensation to the person that was given the electroconvulsive therapy. What can we say? About time! Get this one passed! Write your legislators now! Emil Kraepelin (1856-1926), known as the “father of modern psychiatry” and original architect of what became the Diagnostic and Statistical Manual of Mental Disorders (DSM), established the basic suppressive fundamentals of the Holocaust. The pattern was: Label someone with a false psychiatric diagnosis; Remove them from society; Put them into special camps or institutions; Destroy them. Suppress: to put down by force or authority; to squash any attempt at betterment; an antisocial expression of antagonism toward life, living or attempts to do better in life. Psychiatrists today, all over the world, use and apply the same basic suppressive fundamentals of Kraepelin in the mental health industry. 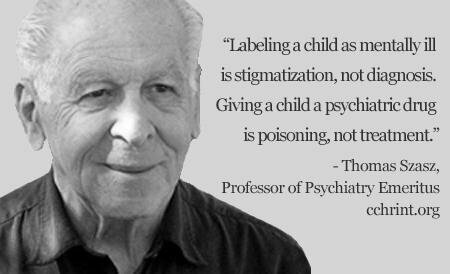 Label someone with a false psychiatric diagnosis; Involuntarily commit them to a psychiatric facility, or put children into foster care, or put the elderly into a nursing home, or enforce psychiatric treatment on those incarcerated in prison; Forcibly give them harmful “treatments” such as psychiatric drugs, electric shock, or brain surgery which either cripples them or kills them. A recently published article in the journal History of Psychiatry by three psychiatrists chronicles the Nazi’s use of electroshock treatment to eliminate mental patients and other “undesirables” from the population. The authors detail that in 1944 Dr. Emil Gelny, working at psychiatric hospitals in Gugging and Mauer-Öhling, Austria, began systematically killing patients with an ECT machine. Today, ECT is a big money-maker for the psychiatric industry. In 1879, German psychologist Wilhelm Wundt (1832-1920) of Leipzig University provided the ultimate scientific “proof” for eugenics and racism, by arrogantly declaring that as man’s soul could not be measured with scientific instruments, it did not exist. Kraepelin was a student of Wundt; in 1917 he founded the German Research Institute for Psychiatry in Munich (funded by the Rockefeller Foundation in 1924), which became the Kaiser Wilhelm Institute of Psychiatry during World War II, and after the War was renamed as the Max Planck Institute of Psychiatry. This institute’s mission was, and is, to prove that mental disorders are just biological, genetic brain disorders. German psychiatrist Alfred Erich Hoche (1865-1943) in 1920 endorsed exterminating “life unworthy of living.” Swiss psychiatrist Ernst Rüdin (1874-1952) worked under Kraepelin for 18 years, and was instrumental in designing The Law for the Prevention of Hereditarily Diseased Offspring in 1933 (the “sterilization law”) which provided the legal basis for compulsory sterilization, which ultimately led to the euthanasia (killing) of six million Jews during World War II. It wasn’t just during the War that these atrocities were perpetrated. Long before in 1905, psychiatrist Rüdin and eugenicist Alfred Ploetz were among the founders of the German Society for Racial Hygiene, a euphemism for eradicating undesirable traits in the population by removing those “undesirables” with sterilization or murder. Starting in 1934 under the sterilization Law, the number of people who were involuntarily sterilized may be as high as 400,000, with up to 5,000 who died as a consequence. Another 275,000 psychiatric patients were murdered, including an estimated 100,000 who starved to death in German mental hospitals. Starting in 1938 the “child euthanasia” program killed over 5,000 babies and children in 31 “pediatric wards” by the psychiatrists in various psychiatric hospitals. Then in 1939 the first gas chamber killings began in Fort VII concentration camp in Posen, Poland. In 1940-1941, over 70,000 mental patients were killed by poison gas in six psychiatric centers. From 1942-1945 another 250,000 mental patients in psychiatric hospitals were killed. This was only the beginning of the psychiatric atrocities. For more information, watch the CCHR Documentary The Age of Fear – Psychiatry’s Reign of Terror, which contains shocking personal testimony and revealing inside footage that tell the true story of psychiatry, whose reliance on brutality and coercion has not changed since the moment it was born in Germany. The Age of Fear education package is also provided free of charge to historians, professors and human rights activists who give lectures and group instruction, teach school or university classes or run community learning programs. 1. Psychiatrists-the Men Behind Hitler, by Dr. Thomas Röder and etc., Freedom Publishing, 1999. 2. Die Gesellschaft Deutscher Neurologen und Psychiater im Nationalsozialismus (The Society of German Neurologists and Psychiatrists in National Socialism), by Hans-Walter Schmuhl, Springer, 2015. Professor Schmuhl is a German historian who has published numerous history books, especially the history of euthanasia. 3. G Gazdag, GS Ungvari, and H Czech, “Mass killing under the guise of ECT: the darkest chapter in the history of biological psychiatry,” In History of Psychiatry, Sage Publications, 2017. JUNE 12, 2017 – JEFFERSON CITY, MO. – Watchdogs Children’s Rights, National Center for Youth Law (NCYL) and Saint Louis University School of Law Legal Clinics have today filed a landmark, civil rights complaint against Jennifer Tidball, Acting State Director of the Missouri Department of Social Services and Tim Decker, Director of the Children’s Division of DSS, on behalf of all minor children and youth who are or will be placed in Missouri’s foster care custody. Given the lack of research on the safe and appropriate use of psychotropic medications in children, it is of particular concern when children are exposed to “outlier” prescribing practices: being given medications that are not approved by the FDA for use in children, combining multiple psychotropic medications, dosages that exceed recommended amounts, or given these drugs at a very young age. “These children are being prescribed too many powerful and potentially dangerous drugs, at unacceptable dosages and at too young an age. The federal government has cautioned strongly against these practices. It’s time that Missouri is held accountable to the children in its care it promised to protect,” states Sara Bartosz. Fighting to transform America’s failing child welfare, juvenile justice, education and healthcare systems is one of the most important social justice movements of our time. Through strategic advocacy and legal action, Children’s Rights holds state governments accountable to America’s most vulnerable children. A national watchdog organization since 1995, Children’s Rights fights to protect and defend the rights of young people, because we believe that children have the right to the best possible futures. For more information, please visit www.childrensrights.org. The National Center for Youth Law is a non-profit law firm that helps low-income children achieve their potential by transforming the public agencies that serve them. For more information, please visit www.youthlaw.org. For more than for 40 years the Saint Louis University School of Law Legal Clinics have created a tradition of social justice by providing invaluable legal services to the greater St. Louis community. Dedicated to the University’s Jesuit mission of advocating for the disadvantaged and the betterment of the community at large, the Legal Clinics provide unique and challenging opportunities in a supportive experiential learning environment for every student who desires a clinical experience, please visit law.slu.edu/clinics.